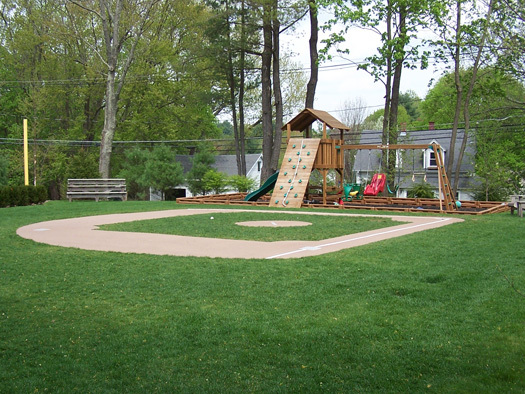 Create a fun, clean, and safe area for your children to play in the landscape while being eco-friendly and promoting drainage. This Newton play set is installed in a modest yard by nestling it into a visible corner of the property. Proper clearance for swinging along with a deep riverstone base makes this a very safe place for all child activities. The pea stone base in this application is also helping keep the property well drained. Set up at the properties natural low point, it serves as a perfect location to allow percolation and water recharge into the sub soils.